Anzac Day is nearly upon us and to continue with my tradition here on the blog, I have a brand new recipe incorporating the gorgeous flavours of Anzac baking in something a little different – these delicious Anzac Muffins! 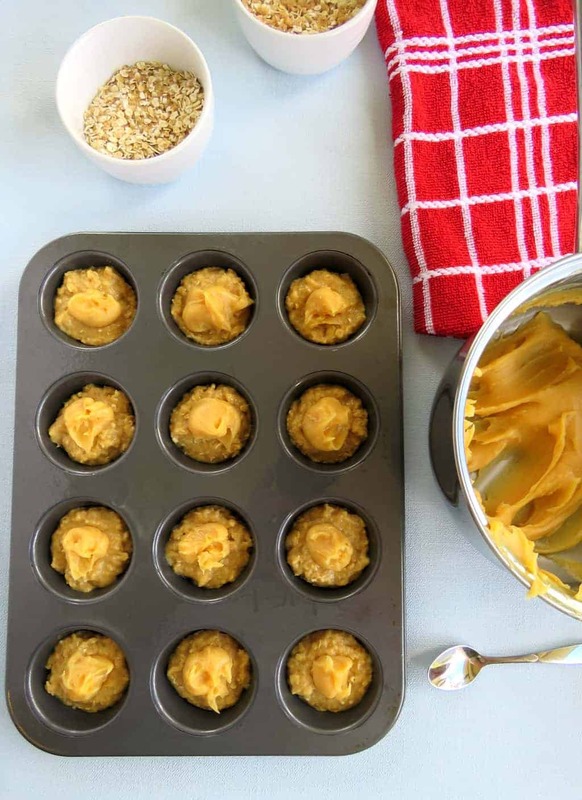 This recipe is a delicious combination of a flavourful Anzac muffin with the centre generously filled with rich creamy caramel. All of the steps are really simple but a little more involved than your usual quick muffin, and well worth the effort! 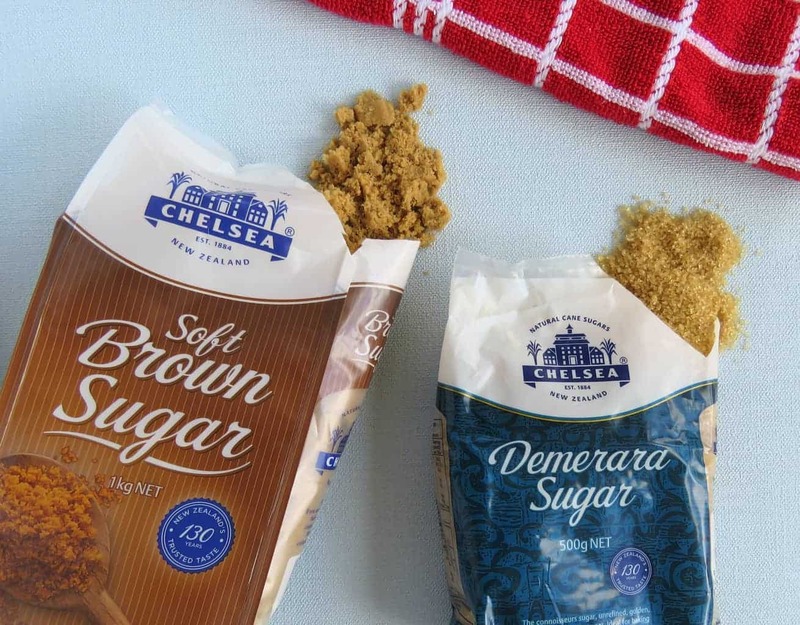 Chelsea Sugar products are such a staple in any Kiwi bakers pantry so I was delighted to partner with them again. The classic flavour of Golden Syrup is a Kiwi tradition, much loved in baking and drizzled over all sorts of tasty treats! The flavours of Chelsea Soft Brown Sugar and Chelsea Golden Syrup in this recipe are perfect! Even the caramel has Golden Syrup blended through it. My Anzac biscuits and Anzac Slices all contain these classic flavours and when these muffins were cooking the family came running to see what the great smell was! 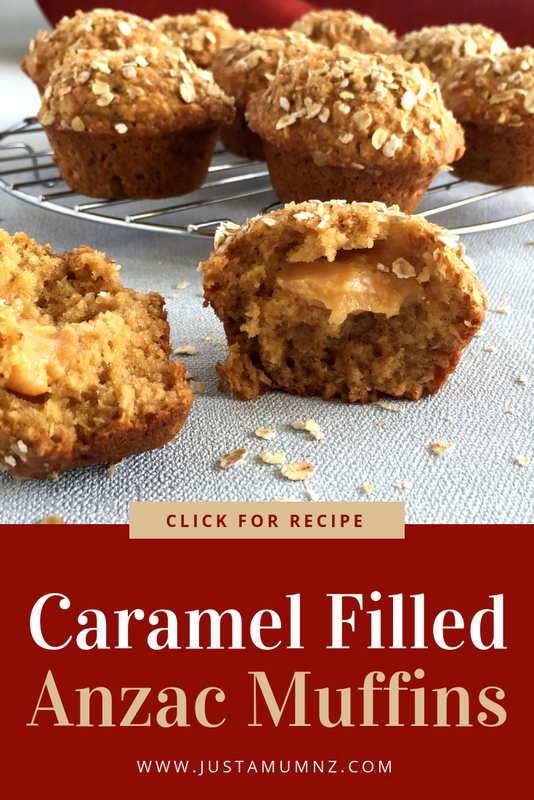 You can easily skip the caramel centre but I think it made the muffins more moist and added such a delicious treat to each mouthful. I think next time we might add even MORE filling to each one, because why not! While testing this recipe I tried out a few sugars to see which gave me the best result. I, like many of you, have various types of sugar in the pantry. In some cases sugars are interchangable and will add the sweetness you desire to any recipe, with a few tweaks. But in the case of Brown Sugars, Demerara and the like there are a few extra features that can make all the difference. This is more than just grain size. All sugar goes through different preparation processes to get the signature flavours we love to use! In this case, I will focus on Chelsea Soft Brown Sugar vs Chelsea Demerara. 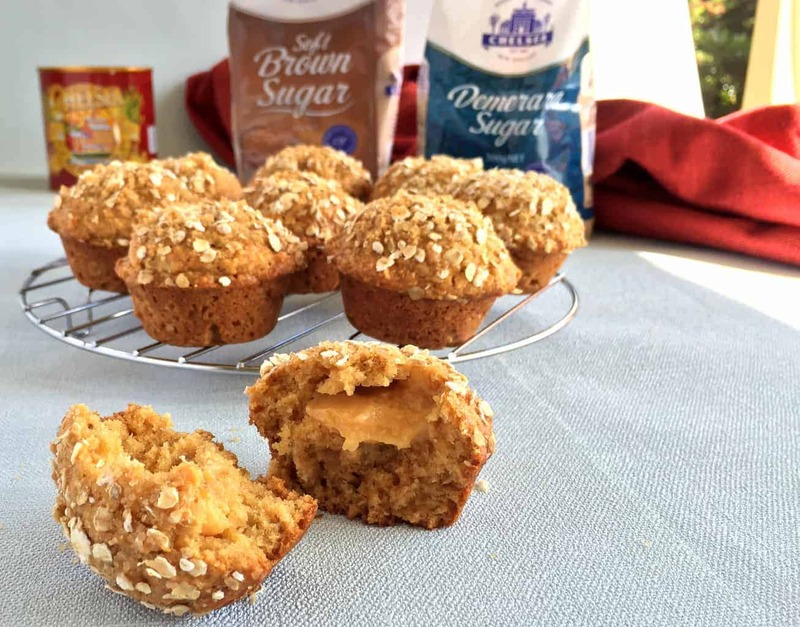 Both could be used in this recipe, the Demerara gives a lovely crunch with the differing and larger sized crystals, the Brown Sugar gives a richer flavour and moistness to the muffins. They are in fact completely different sugars! 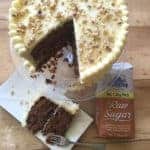 While brown sugar is super fine white sugar coated in a rich molasses to make it ideal for many baking uses, Demerara is a raw sugar with a much coarser grain with natural occurring caramel flavours. Its coarse grains are ideal for coffee lovers, but also makes a lovely addition to muffins to give a crunchy finish if sprinkled over top or the caramelised topping on a Creme Brulee. 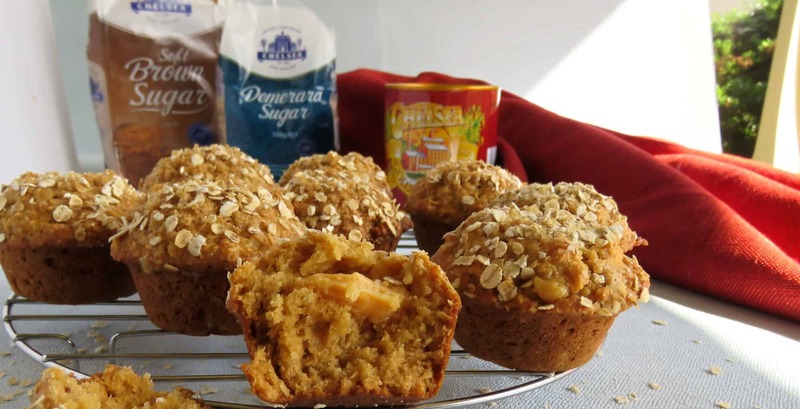 You could use both here, the Chelsea Soft Brown Sugar in the muffins and the Chelsea Demerara on top. I found in this case the Brown Sugar worked better for the muffin base as it added to the moistness of the muffin. But don’t be afraid to experiment and look into the various sugars as it could make all the difference in your next baking adventure! So onto the recipe, there are three distinct processes, each best done separately unless you are a complete whizz at multi-tasking in the kitchen. 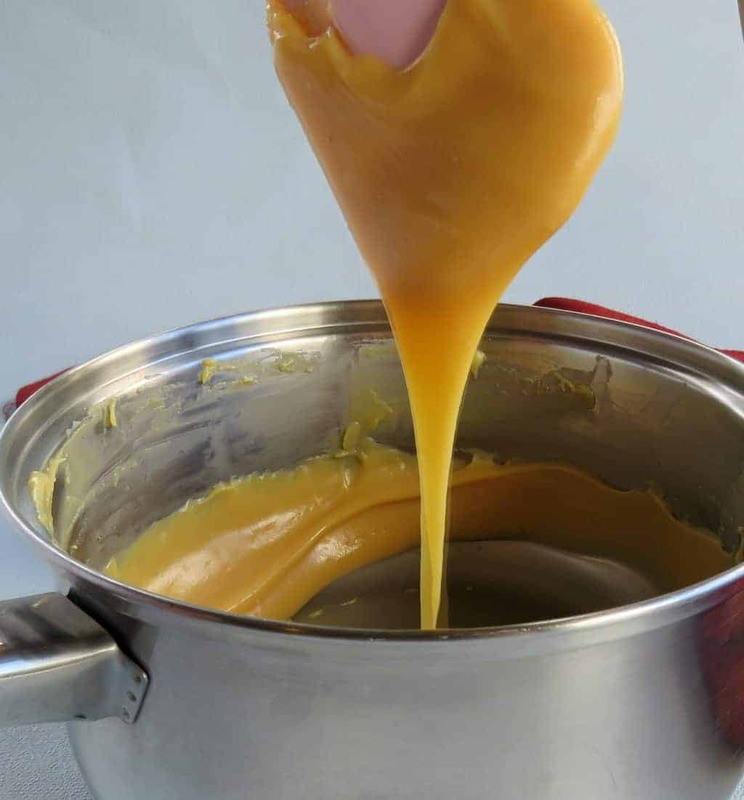 Firstly prepare the caramel filling, taking care to stir continuously so the caramel doesn’t catch, then preparing the wet ingredients to allow sufficient time to cool while you prepare the base of the muffins. I look forward to hearing what you think! Do you think you will make it? Definitely pin it! Heat gently on low, stirring continuously with a rubber spatula to ensure it does not stick to the sides or base. Gently cook for 6-8 minutes until it begins to just thicken and slightly change colour. Remove from the heat once boiling and add the baking soda and whisk well, the mixture will froth and rise! Set this mixture aside to cool completely while you prepare the rest of the recipe. 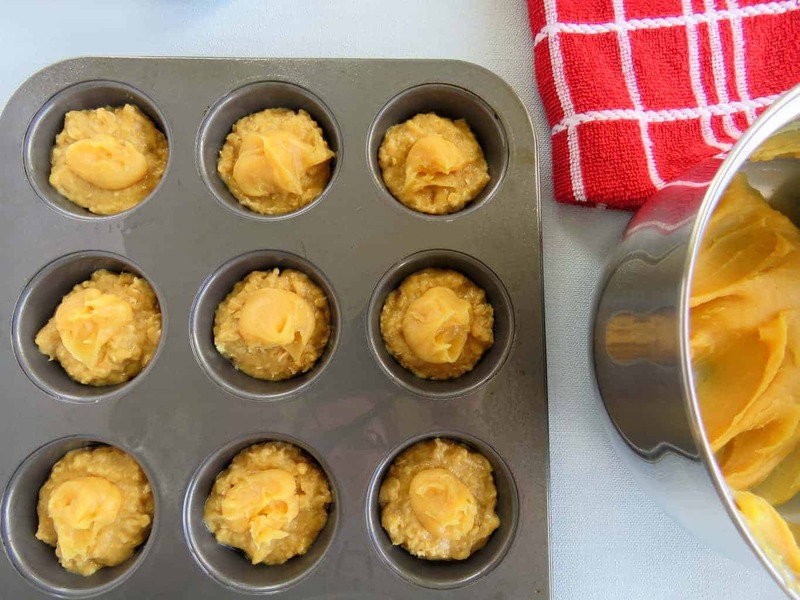 Preheat the oven to 180C and prepare a muffin tray with baking spray or cupcake cases. In a medium mixing bowl add the flour, rolled oats, baking powder, brown sugar, and coconut and mix well to ensure no lumps remain and set aside. In a small bowl combine the topping of rolled oats and brown sugar and set aside. Once the butter mixture is cool add an egg to it and whisk well to combine. Pour the wet ingredients into the dry and gently mix until just combined. Do not overmix. Half fill each cupcake case with muffin mixture, then spoon a generous teaspoon of caramel filling into the centre of each one. Then top with the remaining muffin mixture until nearly full. Bake for 20-25 minutes until the muffins spring back to the touch. Remove to a wire rack to serve warm or cold. These are beautiful served warm or cold. They will keep well in an airtight container for a few days, if they last that long! 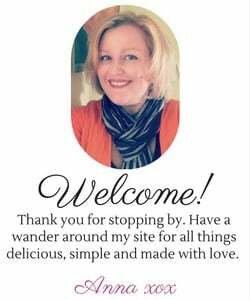 Thank you so much for stopping by to check out this recipe. Please also follow me on Facebook or Instagram and you can be one of the first to receive my new recipes by subscribing via email in the link below. Got be Anzac bikies so going make these muffins tommorow. ANZAC slice you made last year was delicious. I’m going to attempt these muffins too so I might just have two favourites!! My all time favourite has always been the anzac biscuit, which I make a mostly gluten free version. 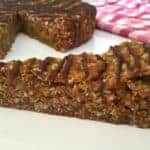 I usually make Anzac biscuits but this recipe is my new favourite , my three children love to bake and we are definately going to get the ingredients and do this one …yum! Just the classic ANZAC biscuits normally but keen to give these muffins a go this year! I love Anzac biscuits but am deffintly going to bake the Anzac muffins with the caramel filling and will share with my work mates. I love Chelsea’s caramel ANZAC slice recipe – it’s become a family favorite! Why can’t you use 1/2 tin of caramelised condensed milk? Hi Amanda, you are very welcome to. I prefer the taste of this caramel, but you are welcome to amend any of my recipes. Let me know how it goes. Absolutely love the Gooey Caramel Anzac Slice recipe from the Chelsea recipe page. Up until now Anzac biscuits. Now without even making them your Anzac Muffins will be. I love muffins more than biscuits as they are soft and moist. My Fav was Anazac bikkies…thr ones that have acrunch on the outside the insides chewy…but now….it has 2 be these muffins with that delicious anzac flavour and caramel…what a combo! Kids love eating AND making ANZAC biscuits for sure. I love your Anzac slice! My fav is plain old Anzac cookies, so good! I messed with them once by adding muesli in and they ended up amazing! I keep meaning to try your Anzac slice…and these look so good, too!! Last year I made Anzac tan square which was delicious but this year I’d love to give these muffins a go. Yum der going to give these a go!! my fav is and anzac caramel pie basically anasc biscuit base with caramel filling with some of the base sprinkled on top sooo yum!!! Well it looks as though these are going to be my new fav go-to recipe, yum! Can’t go past an Anzac biscuit, chewy and soft!! Anzac biscuits are the best! I am going to try this recipe next weekend with my 4 year old nephew who loves baking! Edmonds Anzac biscuits were my fav. I’ve not made them for a few years as I’ve had to go gluten free. And I’ve not yet tried to make them using quinoa flakes in place of rolled oats, as I’m not sure I am handle the disappointment if the texture isn’t right. But now i think I might have found a new way to get the flavour that I miss!! And some caramel too!! 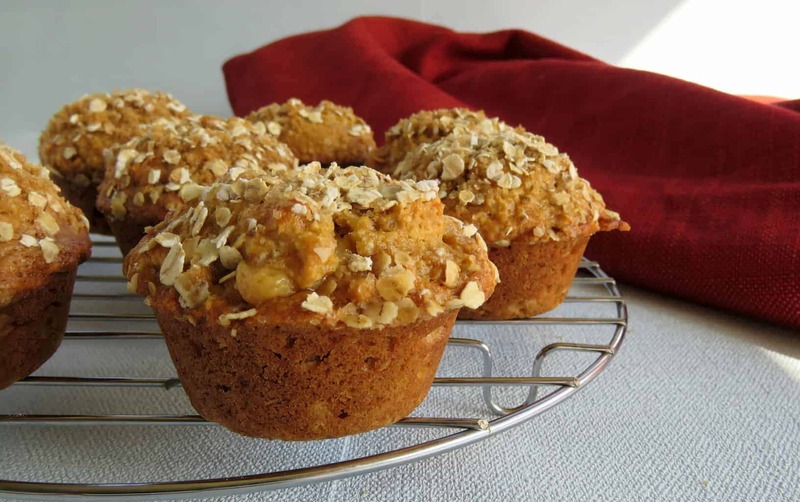 The ANZAC muffins with caramel inside are beautiful! My husband has recently started baking and he managed to create some beautiful muffins from the recipe, an amazing feat for him! I would love to win the $100 voucher so he can keep up with this wonderful new-found love of baking he’s acquired! I love Anzac bikkies dunked in a cup of tea. I am looking forward to giving the Anzac muffins a go though (assuming the teenage boys actually leave any!). anzac slice with a caramel filling goes down a treat with my teenagers. I have made the Edmonds Anzac biscuits. I like the sound of the Anzac Caramel Slice. My favorite is a soft, chewy ANZAC slice. But these muffins like GOOD so definitely can’t wait to give these a try! I’m gunna try find some jersey caramels or freeze the caramel in ice cubes to pop in in the centre! Am also gunna use the other half of the condensed milk and caramel the top and roll in slivered almonds! Glam em up a bit! I love Turkish ANZAC biscuits that also incorporate vanilla extract, rosewater, slivered almonds and a dust of icing sugar! They are absolutely divine and a little bit exotic! Usually ANZAC biscuits but this year in trying your muffins for work & your slice for us at home. They look fantastic! 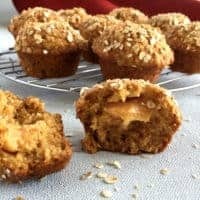 My all time favourite is Anzac caramel slice but after making these muffins I’d say it’s first equal! Gooey Anzac Caramel Slice but this might top that when I try it. I made some recently from the chealsea site – it was a readers recipe. It had pumpkin seeds in it. I also added some raisins. They were really yum! Classic Anzac bikkies and I will try these muffins next week for sure! My favourite is Anzac biscuits and I love to add raisins to the mix. Delicious! My favourite is your Anzac slice recipe, easy and yum. Haven’t gotten around to trying the caramel version yet. You can’t beat Anzac biscuits but these Anzac muffins sound delicious!! 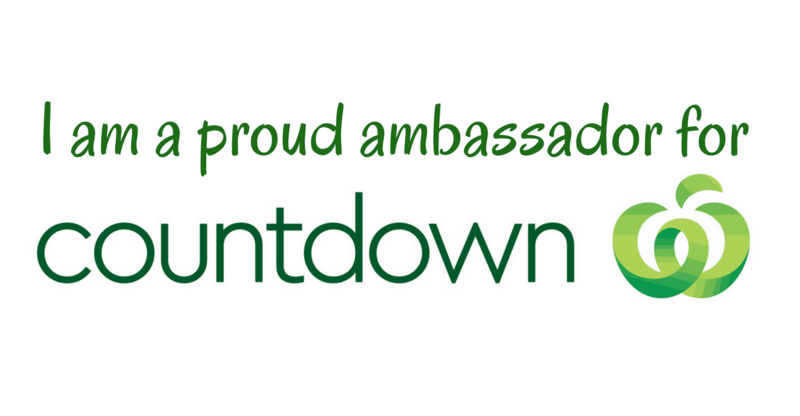 Hi – i love Anzac cookies, especially when theyre chewy! 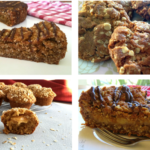 But i keep seeing comments about Anzac Caramel slice……..OMG…my idea of heaven! I work with 5 boys in a Residential home, one of them is a keen cook. I think we’ll have to try to make the cookies or the caramel slice over the next few days! I’m a bit obsessed with Anzac flavours! Both a plain and a caramel version of the Anzac slice are in the blog, check out the sweet recipes tab and slices. 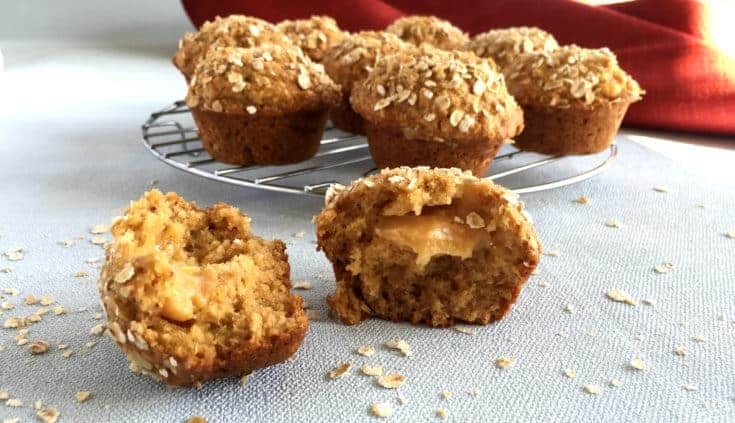 My favourite is the traditional Anzac biscuit but I’m going 2 make these muffins 2day so my opinion could change after hearing the wonderful feedback about these muffins. I love the sound of these! My favourite ANZAC recipes are ANZAC bars, which is kind of like a muesli bar, and the ANZAC self saucing pudding by Allyson Gofton, but I put my own twist on it 🙂 I am looking forward to giving these muffins a go too though! Yum! My 3 year old and I are making these muffins right now. He was so excited when the baking soda frothed the mixture up – whereas I was pleading with the baking gods for my pot to be big enough for the mixture to not spill over. This is definitely our favourite recipe and we will be making a tradition of making them! Some for our house and some for Nanas, cant go wrong! Anzac biscuits however when I make these that could change!! Got to love the classic Anzac biscuits. Can’t wait to try these muffins. Just made these (it’s Anzac Day), yum yum!